Nationalization disputes in natural resources development are among the most disputed issues of international investment law. This book offers a fresh insight into the nature of nationalization disputes in natural resources development and the rules of international investment law governing them by systematically analyzing (1) the content of investment contracts in natural resources development, and (2) the results of nationalization disputes in natural resources development from the perspective of dynamic bargaining theory. 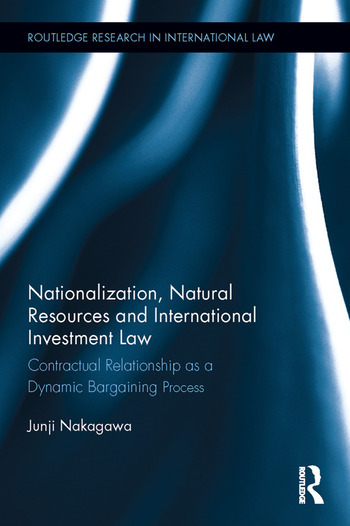 Based on the comprehensive and systematic empirical analyses, the book sheds new light on contractual renegotiation and renewal as a hardly known but practically normal solution of nationalization disputes and presents a set of soft law rules governing contractual renegotiation and renewal. Junji Nakagawa is Professor of International Economic Law at the Institute of Social Science, University of Tokyo, Tokyo, Japan. His publications include WTO: Beyond Trade Liberalization (Iwanami Shoten, 2013, in Japanese), Transparency in International Trade and Investment Dispute Settlement (Routledge, 2013), Multilateralism and Regionalism in Global Economic Governance (Routledge, 2011), International Harmonization of Economic Regulation (Oxford University Press, 2011), Anti-Dumping Laws and Practices of the New Users (Cameron May, 2007), and Managing Development: Globalization, Economic Restructuring and Social Policy (Routledge, 2006).